Long before the historians or the peoples they wrote about, came to the valley in the shadow of the Blackstairs Mountains, the waters of the sea washed the Irish shore near where the village of Clonegal now stands. A geological upheaval saw the seas roll back and the range of the Wicklow foot-hills, down to the Gibbet Hill rise to cover one of the most western Faults in Europe. Tremors have been felt along this fault in the 70’s and 80’s down the coast as far as Enniscorthy. This Fault is said to run from Norway and Sweden under the North Sea, the Scottish mountains, the North Channel, Mountains of Mourne, and the Wicklow mountains, to just north of Enniscorthy. What is now the parish of Clonegal comprises the ancient parishes of Moyacomb and Barragh. Magh-da-chon, “The plain of the two Hounds” covered the region from the foot of the mountains (Blackstairs) in the South-east, to Balisland, and northward through Orchard to Ardattin, then westward to Kilbride and Barragh. This district is stated in O’Huidrin’s Topographical Poem as being the ancestral patrimony of O’Neill of Leinster. The Four Masters also refer to it in their mention of the “Battle of Rath-Edair, (Hill of Howth), between the men of Munster and the men of Leinster”. 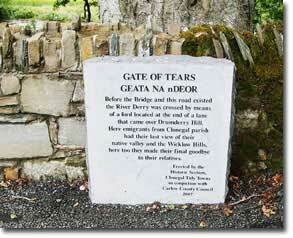 In their account of the battle, they name among the defeated Leinstermen, “Ua Neill of Magh-da-chon”. This reference is in A.D. 1087. Earlier we find that, Cernach, Lord of Ui Bairche and Magh-Da-Con died in 856 A.D. The name of the village of Clonegal is “Cluain na nGall” or meadow of the stranger. Its origin is probably derived from one of two buildings, which added to the beauty of the valley, the Abbey of Doune, or as the townland is called to this day Abbeydown. This was the site of an Augustinian Abbey, said to have been founded by the Danes, who although they generally set up their settlements along the coast, sometimes followed the rivers many miles inland. They were referred to by the native Irish as the Gaul, or strangers, thus, Meadow of the Stranger. Some hold that it could be a misspelling of the word Gaul for the Irish for Meeting, and that the real meaning is “Meadow of the Meeting” or where the rivers Slaney and Derry meet. How far back into history we can trace life in the valley of Clonegal is hard to define but a grave in the townland of Moylisha is known as “Labba na Shee”, the bed or grave of the fairies. This is taken to refer to one of the first races of people, or as they were often spoken of, the fairies of ancient Irish history, The Tuatha-de-Danaan. The Tuatha-de-Danaan, were a timid people and, when the more warlike Milesians came to our shores, they shrank into the deeper forests and eventually went under-ground. It is said that they were the original fairies, only appearing for fleeting moments, thus giving rise to the many stories of their strange doings throughout the pages of Irish folklore. Other traces of ancient times are to be found in the shape of the remains of the oratory of Ard Briton, in the townland of Orchard, and a place on Newry Hill where the ancient Irish judges sat to give judgment. It is known as Rath-na-Doran. The Dorans were the Brehons, the hereditary judges of Leinster. Clonegal is situated on the banks of the River Derry (River of Oak) about one and a half miles from where it joins the Slaney at “Youngs Bridge”. The district between the Blackstairs and the Wicklow mountains was a wooded region in the 1500’s. It was also the section of the country in which the clan of Kavanagh ruled, from the castles of Clohamon, Clonmullen and Clonogan. Queen Elizabeth’s forces captured three castles in the district in 1588. This region was known as the “Leveroch”, and was given by Royal Order to the Netterville family, who sold it to the Esmond family about 1615. Clonogan Castle was just outside Clonegal on the Tullow Road. The building is known for years as Huntington Castle and now once more called Clonegal Castle was turned into a fortress in 1625, taking five years to complete. It was sold to the Leslie family of Limerick, but was purchased by Alexander Durdin in 1780. The Esmond’s had called Huntington after the town of Huntington in Lincolnshire in England, where the family came from. The Durdin family later intermarried with the Esmond’s, and a great-grand-daughter of Alexander Durdin, Helen, married Herbert Robertson, and their descendants are still in possession. The Castle is built over a well, 17 feet from crown to bottom, which is still in use. The well is said to be pre-Christian. The original walls of the castle are six feet thick at the bottom. On the southern side of the castle, along the lower lawn runs the “New Walk”. This walk is about 600 years old, and is thought to be part of the cloisters of an ancient abbey, the ruins of which are in the castle grounds. The beauty that is the valley of Clonegal to-day, with it’s wooded slopes and fertile fields, its well kept homes and peaceful aspect, its gently flowing rivers, give little indication of the turbulent past of the village. The Northern Pass into Wexford was through the valley of Clonegal and in the 17th century the village was the scene of much activity. Business houses, large Cattle and Sheep fairs, Flour and Woollen Mills, a tanyard and one of the sweetest distilleries in Leinster gave it an air of importance all it’s own. It was into this valley that the Cromwellian forces marched after the capture of Tullow Castle in 1650. It was in this valley that the hill clans of the Kavanaghs, the O’Tooles, and the O’Byrnes determined to make a stand against this tyrant who put all who crossed his path to the sword. The clans mustered in the village of Clonegal, and planned to attack the Cromwellian forces, under Colonels Reynolds and Hewson, in the street of the village. The clansmen were probably commanded by Donal Kavanagh, the last of the chiefs of Clonmullen. The forces of Cromwell marched into the valley by the old road. This was through “Orchard of the Bards”, and over Monaughrim Hill. The river Derry flows through Clonegal, and where the bridge now stands was but a ford at the time. This ford was to see the deaths of many brave clansmen before the day was out. The mountain men had waited until the enemy were in the street of the village before they attacked, but the element of surprise was not enough, and they were cut down by deadly musket fire. Some tried to escape across the ford but were slaughtered in the water. Others escaped to Kilcarry wood, which was surrounded, and all who were caught put to the sword. It was probably because of this attack that the surrounding castles were garrisoned so strongly and the name of Kavanagh ordered to be erased from the valley for all time. The memory of this battle is recalled in a stanza by Fleming, one of the last of the “Bards of Orchard”. Choked up with carnage and stopped in their ways. Fleming was a teacher of local history as well as a poet, and had a number of pupils who attended his residence. The site of his home is still known as “The schoolhouse field”. The Kildavin road, as it is called, runs parallel to the Derry for a little over a mile in a south-westerly direction from Clonegal. It then crosses the Slaney just south of where the rivers meet and leads on to Kildavin. As one approaches the village we pass the Spellman Park on the left of the road. This park is named after the late Cardinal Spellman of New York, whose ancestors came from Kilbride, and are buried in the grounds of St. Lazernan’s church, Kildavin. The Cardinal also built the Spellman Hall in Kildavin Village. Kildavin, like Clonegal, once was a busy little village. A mill at Ballypierce, just outside the village, gave good employment; it also boasted a corn store, wool store, forge, post office and shops. The R.C. church of St. Lazerian, and the Church of Ireland church of St. Paul adorn the village with magnificent splendour. Barragh church, is supposed to have been founded by St. Barragh of whom it is hard to find any account except in the History of St. Finian of Clonard. St. Finian on his return from a mission in Wales founded a monastery in Aghold, Co. Wicklow. From there he went to many places including the territory of Barragh over which the chieftain Dermot ruled. Here he erected his missionary church. Some distance North of the church of Barragh is a Blessed Well, known as the Cronavane Well. This well is actually the third of three wells in what was probably the site of a monastery of Barragh. Like so many other Blessed Wells in Ireland the Cronevane well was once the place of great devotion. Many years ago a Pattern used to be held there but has been discontinued since 1798. Efforts are now being made by some local people to have the well restored. This Monastery was once the home of students from other lands who came to study in the peace and tranquillity that was Barragh. The well is still visited by those suffering from limb pains and sore eyes. Clonmullin Castle: The castle of Clonmullin, home of the O’Cavanagh clan, is perhaps better known as the home of Ellen Kavanagh, the “Aileen Aroon” of the Poet whose romantic story is told by hartstonge, in “Minstrelsy Of Erin”. This story of romance, from so long ago, could well be turned into a best seller to-day. The love, the family opposition, the secret agents, the secret of the song, the daring of O’Daly, the plan and the final escape and marriage are the making of a real life drama. It was under the leadership of the O’Cavanagh’s that the hill clans mustered in Clonegal in 1650. All traces of the Castle have long since disappeared and nothing now remains to tell us where the home of this warlike clan who once ruled in splendour was. It is said that the stones of Clonmullin went to build “The Chase” near Bunclody. Despite Cromwell’s order ‘That the name of Cavanagh should be erased from the valley and never more be heard from the Nine Stones to the Wicklow border’ the Kavanagh’s are now back stronger than ever from Mt. Leinster to the Wicklow Mountains. A Pat. Roll, June 13th. 4 & 5 Phillip and Mary, records the pardon of Arte McMoriertaghe Kavanaghe, otherwise called Arte Boye, of Clanmullen, in the county of Carlow, gent. So the Kavanagh’s are legal holders of their lands once more. The visitor to the Parish of Clonegal will find much to interest him. Approaching along the main road from Carlow his first view of this beautiful valley will be from the top of Boggan Hill in Kilbride. To his right rises the wooded slopes of Sherwood, in front the long run to the foothills of Mount Leinster and the fertile fields of Wexford, and to his left, the fall to the Slaney and then the rise to Monaughrim and the old road from Tullow. It was from this part of the parish that the ancestors of the late Cardinal Spellman of New York came. Staying with the main road we reach Kildavin and head on to Bunclody through the lovely Slaney Valley, the surpassing beauty of which inspired the late Senator Patrick Kehoe to pen the words of that lovely song “Slaney Valley”. Few indeed are the beauty spots to match the view of the Slaney as it winds through Drumderry and enters the county made famous in ‘98, “Wexford, lovely Wexford, Fairest land of all to me, With the Slaney gently flowing From Bunclody to the sea”. To approach Clonegal from the North-West, or over the old road from Tullow our first view of the valley is breath-taking. Away to the left the Wicklow Mountains rise in magnificent splendour. To the right the purple clad Blackstairs reach to the sky, and the silver ribbon that is the Slaney weaves it’s way through the valley and the myriad shades that are equalled no-where else in Leinster. From here we can see Ballyredmond Wood, said by many to be the Black Wood referred to in history as the last meeting place of Ard RI and Diarmuid McMurragh before the latter went to seek the aid of the Normans. The river Derry forms the boundary between Wexford and Carlow, and divides the village of Clonegal in two. The part of the village in Wexford is known as The Watch House. The name comes from the fact that when the 1798 Rising commenced a hut was built at the Water House cross which was manned by Yeomen or soldiers day and night. A person bringing an animal to the fair of Carnew had to get a permit at the Watch House cross, and if he failed to sell he had to get another permit from the Yeomen in Carnew to bring the animal home. In the avenue leading from the village to Huntington Castle stands the tallest Lime tree in Ireland, and in the field on the left as we approach the castle is a stone known as the “Wart Stone”. This stone is also pre-Christian. The Grapevine in the conservatory at the castle is said to be taken from the great vine at Hampton Court which is supposed to have been planted by King Henry VIII. Among the original features still surviving in the castle are the old kitchen fire-place, large enough to roast an ox, the iron gate at the front door, and probably the door itself. Clonegal has many other places and buildings of interest like the Wool Store and Corn Mill that is now a Supermarket. The old Rectory where Bid Doolin, better known as Biddy the Pointer, pointed out the insurgents to John Derenzy and the Yeomen, the Hanging arch. The house in High St. that was first a convent, then a curate’s residence and now a beautiful home. The list of the members of the Church of Ireland who organised and subscribed to the building of the present R.C. St. Brigid’s Church, (they included John Derenzy), and many other facts that make Clonegal one of the most interesting villages in the country. In recent times it is better known for it’s annual Village Fair on the last Sunday of July. It’s sports clubs, it’s high standing in the Tidy Towns competition, and hospitability to all. To learn the whole story of this village and parish would take the stranger a long time. We feel it would be time well spent, for after all Cluain na nGall is “The Meadow of the Stranger”. Before the Bridge and this road existed the River Derry was crossed by means of a ford located at the end of a lane that came over Drumderry Hill. Here emigrants from Clonegal parish had their last view of their native valley and the Wicklow Hills, here too they made their final goodbye to their relatives. Erected by Historic Section, Clonegal Tidy Towns in conjunction with Carlow County Council 2007.